Organizing your content is key to creating an effective website because it ensures users are provided the content they are looking for, and it identifies gaps where new content should be created. To start, begin taking an inventory of existing content sources. Current or past websites, brochures and other documents are great starting points, as some of the content may just need to be updated or repurposed. 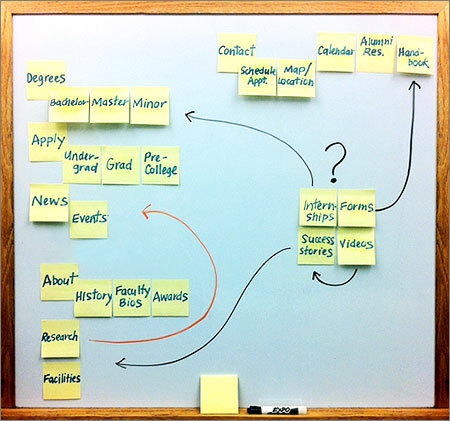 Using either index cards, Post-It notes or a whiteboard, write down everything you want to include on the website. If you are using index cards or Post-It notes, write down one topic per card. Sort the individual topics into groups or piles that "go together," and begin to think of category labels for each pile. This exercise will prompt you to evaluate why certain topics go together, and it will allow you to move items easily between piles and possibly lead you to discover the need for new or different categories. This creative process should demonstrate the different possibilities of organizing the same information. Use keywords and terms that your audience would most likely search on, such as "Calendar" or "Contact Information" or "Fees." Use words that are intuitive, descriptive and easily scannable. For example, instead of a generic label such as "Programs Offered," a more specific label such as "Undergraduate Degree" would better serve your audience. Use phrases that translate into actions (e.g., Apply Now, Schedule a Meeting, Request Help), since most people use websites to perform actions. This will also help you avoid simply using your audiences as navigation items (Students, Faculty, Parents, etc.). While this works in some instances, there is often overlap in both how audiences identify and the content provided to audiences, and you do not want to have to update content in multiple places. Plus, as mentioned earlier, audiences are looking to perform an action. Bucketing them by audience labels can make them hesitate and take them out of their task mindset (Neilson Norman Group, Audience-Based Navigation: 5 Reasons to Avoid It). Use editorial consistency regarding labels and naming; if you choose to use actions as labels (e.g., Apply Now), be consistent and stick with actions for that navigation area. In general, avoid being too wordy as people scan text on web pages. Less is more! The same goes for the number of navigation items. Information overload sets in when people have to look at more than seven to eight navigation items. Having analytics or anecdotal data can help determine the most often viewed content on your current website. In some cases, this could be important enough to warrant it being its own navigation item. Once you are satisfied with the main navigation, you can begin to fill in where your other content will go in your new navigation "buckets." Note: the content outline is meant to be just that, an outline. You do not need to fill in every detail; just enough for a solid road map. Avoid information overload: Try to consolidate your navigation items as much as possible. For instance, you may not need both a Contact Us page and a Visit Us page. Because most people associate an address with contact information, you can combine these pages into one page that contains both pieces of information. Know your audience: The most common mistake people make is that they organize their content according to their internal administration rather than according to how their users will be looking for it. Always put yourself in the shoes of your users. Create a sitemap: To help you visualize your website and all of its content, it's often helpful to create a sitemap. This is essentially a diagram that shows you how each of your pages is connected in an organizational "tree." Use our sample content outline template as a starting point for your own content outline.